This leftover Turkey recipe is by far my favorite way to use up leftover turkey! 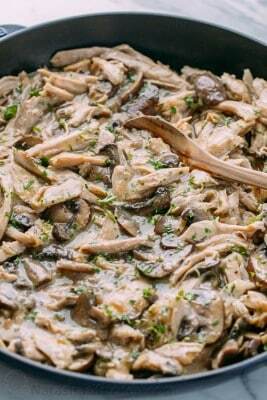 Turkey in creamy mushroom sauce is so easy and a big win in our family! Heat a large non-stick pan over medium heat. Add 2 Tbsp olive oil and diced onions and sauté until soft and golden (4-5 minutes, stirring frequently). Add mushrooms to the pan and sauté until soft and golden (5-7 min, stirring frequently). Remove mushrooms and onions from pan. In the same hot pan (no need to wash it), add 4 Tbsp unsalted butter. Once melted, whisk in 3 Tbsp flour (I used a gluten free flour at my sisters house and it worked just as well!). Cook, whisking continually until youx is a golden brown (1 1/2 to 2 min) then whisk in 2 cups chicken broth. Bring to a simmer and season to taste (I added 1/2 tsp sea salt and a pinch of black pepper). Add add mushrooms/onions back to the pan. Stir in turkey and heat until turkey is just heated through. Garnish with finely chopped parsley if desired.